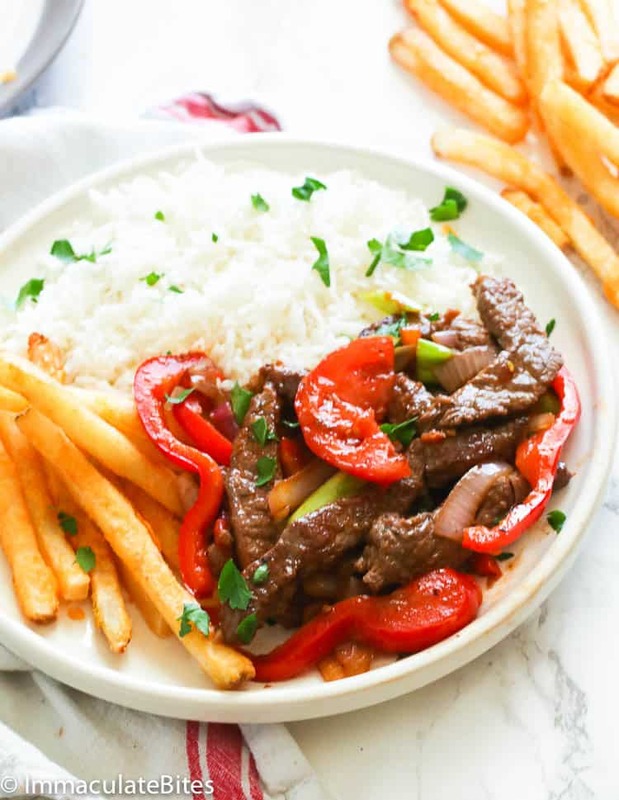 Lomo Saltado (Peruvian Stir Fry) – a very popular Peruvian-Chinese fusion dish using Chinese stir-fry technique fused with Peruvian ingredients. 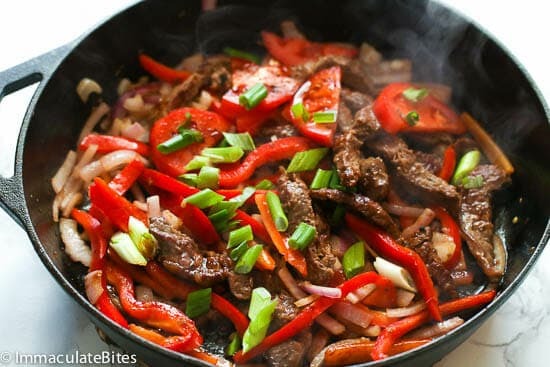 Tender beef strips tossed with flavorful and crisp vegetables and French fries plus an amazing sauce. One of the joys of cooking at home is the freedom to add or reduce any ingredients that you are not particularly fond of. Agree? I did just that with this dish; I added parsley and used sriracha sauce to suit my taste buds. It was exceptional! And it comes together quickly and easily, too. 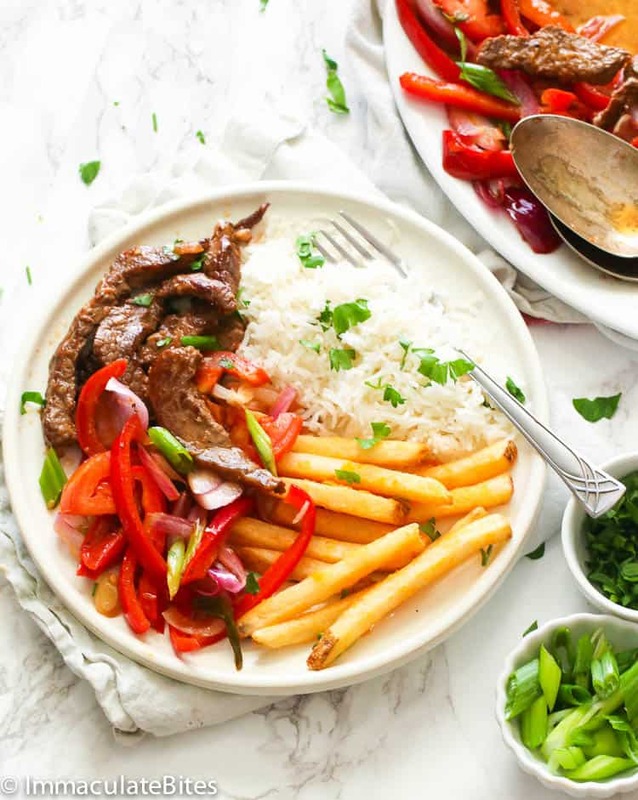 Lomo saltado is a popular and traditional Peruvian dish that showcases the influence of Chinese cuisine on Peruvian food scene or better known as Chifa. 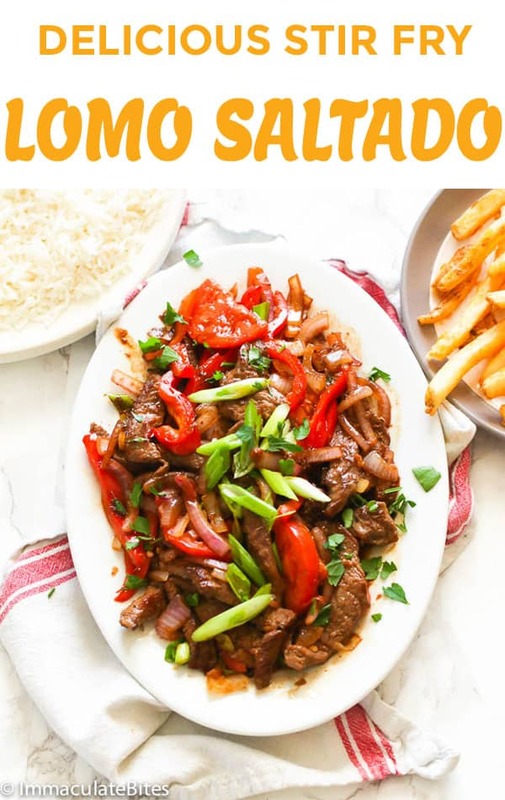 From the word “lomo” which means tenderloin and “saltado” stir fry, this classic dish is made of juicy beef strips stir-fried with onion, tomato, green pepper flavored with soy sauce and aji Amarillo paste. Then finally tossed with French fries for a textural contrast. All of these happening in one pan (or wok). This is typically served with white rice. What type of meat is lomo? Beef tenderloin is simply called LOMO. It’s a Spanish word for tenderloin that can be bough cured or uncured. 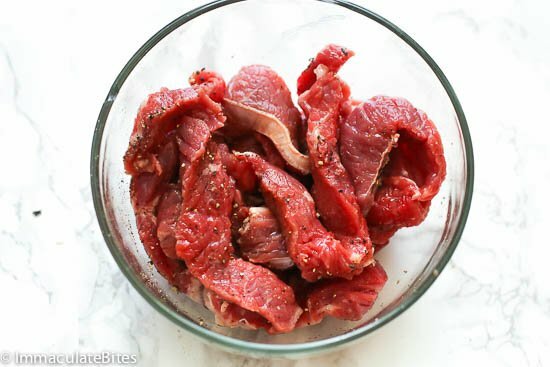 Uncured lomo meat has lesser fat in eat which makes a very good choice for stir-fry dishes. The lomo in this dish means it is a steak, but there are actually chicken and variations of this dish, too. 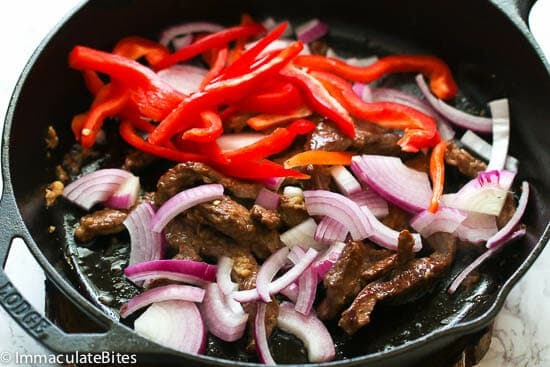 How do you make lomo saltado sauce? Probably the best selling point of this Peruvian lomo saltado dish is its sauce. I can’t stress enough how delicious the sauce is because of the aji amarillo paste and soy sauce combo. This sauce makes it possible for you to cook the beef without even marinating them. It is savory, earthy, a little bit sweet and spicy. Oyster sauce may not be found in the traditional lomo saltado recipe, but it adds more layers of flavor into this dish. 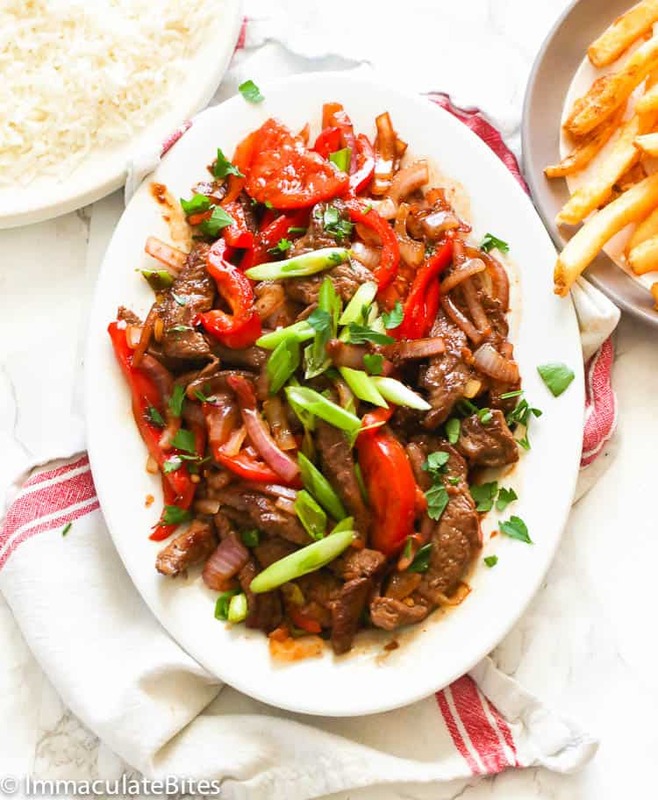 Whenever you’ve run out of ways to cook your favorite beef tenderloin, just remember this quick and easy Peruvian-Chinese beef stir-fry lomo saltado which is utterly delicious. You can serve it with rice for a family weeknight meal or stuff on hoagie rolls for lunch. 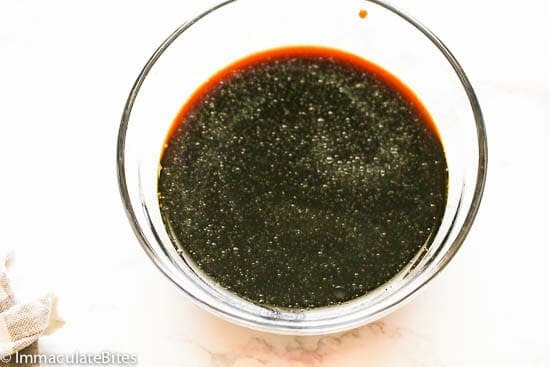 If using regular soy sauce use 2 tablespoons – adjust to taste, you can always add more . Aji sauce is only available at Hispanic markets. Feel free to use sriracha sauce or chili pepper cut in thin slices. As always with stir frying, the cooking is done very quickly so make sure all your ingredients are ready to hit the wok. 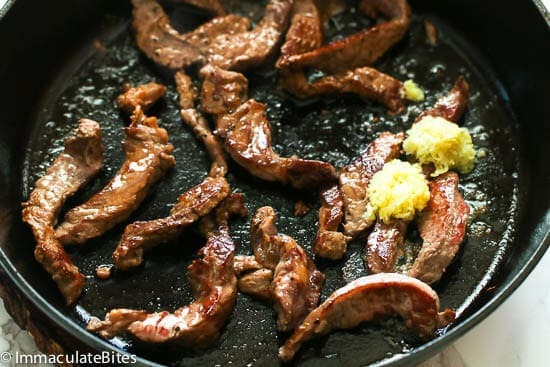 Sirloin steak or better quality steak is best suited for stir frying in this recipe. You can make your own French fries instead of using frozen ones. Crispy fries works best. Do spice up the meat with any spices you like. Serve it over white rice as is customary. This recipe was first published on Oct 2013 and has been updated with new photos and write up. 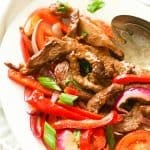 Lomo Saltado (Peruvian Stir Fry) - a very popular Peruvian-Chinese fusion dish using Chinese stir-fry technique fused with Peruvian ingredients. Tender beef strips tossed with flavorful and crisp vegetables and French fries plus an amazing aji sauce to top it all of. So scrumptious and comes together quickly! Preheat oven and bake fries according to packaging instructions, or you may make your own fries from scratch. Prepare and gather all ingredients needed. Combine the ingredients for sauce ; oyster sauce, soy sauce, lemon, beef broth, and sriracha. Set aside. Heat oil in skillet or wok over medium to high heat. 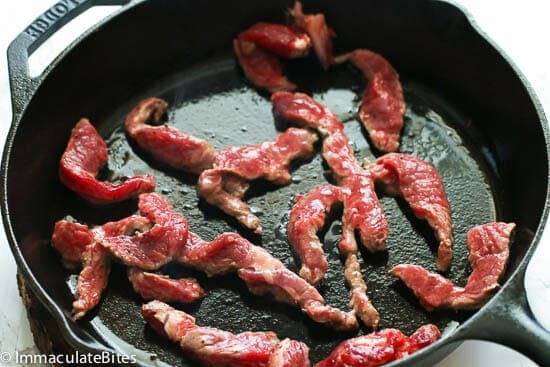 Season the beef strips with salt and stir-fry the beef in skillet, about 30 seconds. You may do so in batches if desired . Throw in the onions, green pepper and tomatoes, stir-fry about 30 seconds. Remove from the heat , garnish with green onion and cilantro. Serve immediately with fries and boiled rice on the side. Squeeze lemon over it . Preheat oven and bake fries according to packaging instructions, or you may make your own fries from scratch. Prepare and gather all ingredients needed. You may do so in batches if desired. Next add garlic and ginger, stir-fry about 30 seconds(be careful not to let it burn. 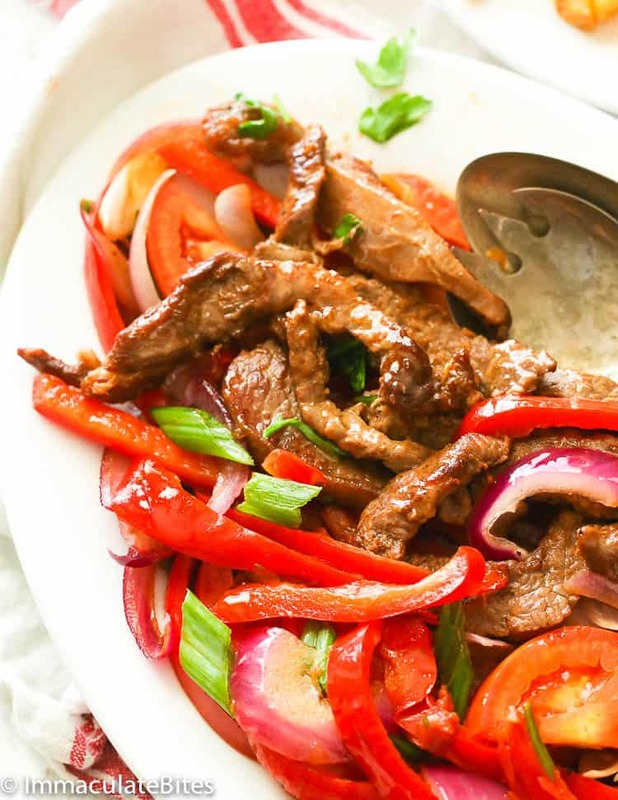 In the original Lomo Saltado it doesn’t include peppers nor oyster sauce. It sure does. In my neck of the woods – most Restaurant Peruvian stir-fry does include peppers . Thanks for sharing !!!! Where can i buy the Aji amiarillo or similar item? You can find Aji amarillo in latina markets,online at amigo foods or amazon. If you can’t find it, replace with chilli sauce or sriracha. This looks sooo yummy!!! No aji amarillo this way, so will just use our regular “pepper”. Keep up the great work mama!! African pepper sauce would work….You have to try this Lola! Believe me people. This dish taste exactly as it looks. Yummy! !! One of my favorite dish here so far. Thanks Devin,glad you liked it!